Hi there, Minds in Bloom readers! Thanks so much for having us! We feel incredibly honored and smarter just being invited here! We have a little confession to make: Minds in Bloom was one of the very first blogs we ever discovered in this world of edublogs…and we’ve been stalking reading it ever since! 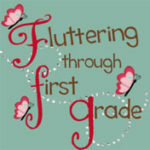 We are Christy and Tammy from Fluttering Through First Grade. 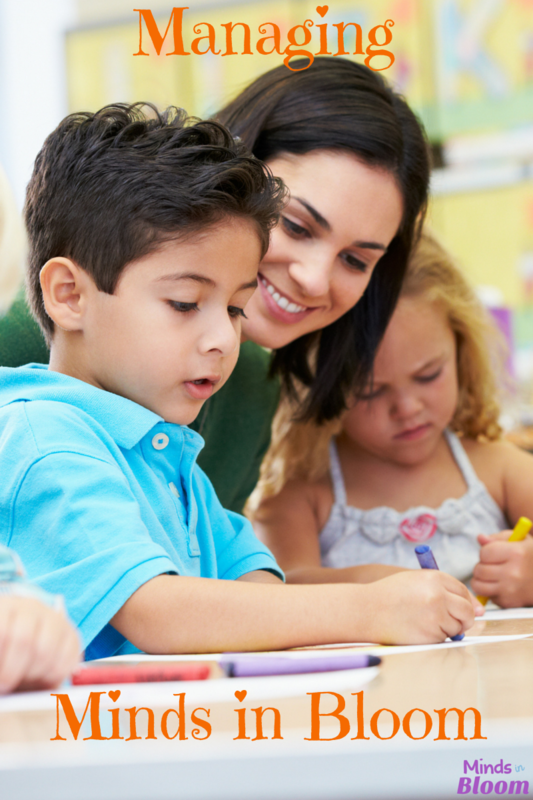 We’re visiting today to share some creative classroom management strategies that keep kids motivated and the classroom creative and fun! Though us teachers may teach a variety of grade levels, we can probably all agree on one thing: All minds need to be managed as they bloom; the trick sometimes is how. We use stickers as motivators with our students. With the introduction of ten frames in the Common Core Standards, we now provide them with a math lesson in addition to behavior management. We ask them to set these on the corners of their desks during work periods throughout the day. As they are working quietly, we reward them with a sticker for their boards. Sometimes, we hand the stickers out ourselves. 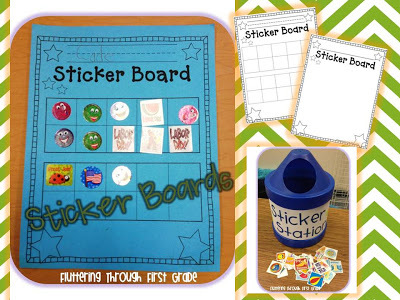 Other times, we allow them to choose from our “Sticker Station” (shown above), which is a tub with stickers for choosing.We’ve offered 2 versions of our Sticker Boards, one with ten frames and one without, which you can grab for free right here. We both have 5th grade sons and have an opportunity to volunteer in their classes on our days outside of our own classroom. One day, there was a substitute teacher, who needed just a little help managing the class. Mommy hats off, teacher hats on! We dug in our first grade bags, and all we could find were smelly, happy face stickers. You would have thought the 5th graders had just discovered the very last Wonka Bar holding a golden ticket! They went cuh-razy! Our lesson: Nobody’s really too old for stickers. Especially the puffy, smelly variety! Tickets can be a great motivator for kids who need something tangible for a job well done. We set containers at each table (to avoid milling about the classroom) and reward students with tickets as they work. We recently found red, yellow, and green tickets at Dollar Tree. The little mailboxes are from Target. We will be using them for the month of February in our class. At the end of the day, of a few days, or of a week (whatever time frame works for you and your students), we pull a winning ticket from each table container. 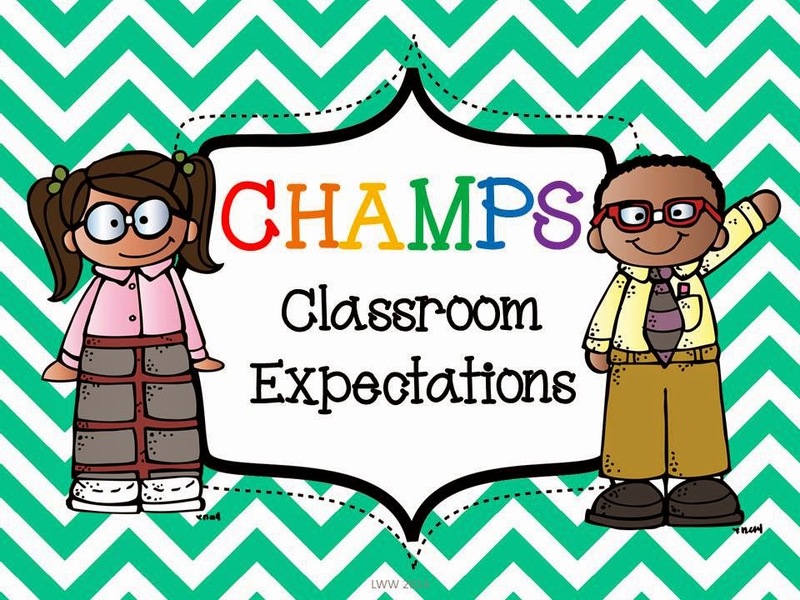 With multiple containers, this gives more kids an opportunity to “win” and provides us teachers with some buy-in from all of them because they feel they have a better chance. They love it! We keep winnings small. Anything from 10 minutes of extra class technology time to adding a special cushion to their hard, plastic school chair for the day. Really, whatever works for you and gets the kids to want to try for tickets! Oh, that title just sends chills down our spines. If you ever had your name written on the board back in the day, then you know what we mean. But, it’s not what you think! Nowadays, we write names on the board when we’ve done something good. No more “bad list.” We draw a different, seasonal picture on the board each month with Vis-a-Vis pens, so they don’t erase without water. 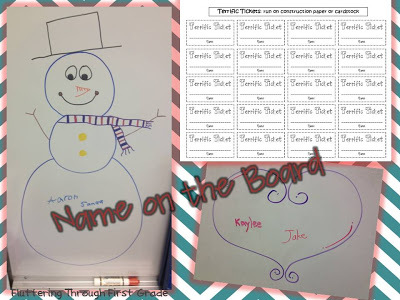 Each day, our students are invited to write their names on the board with a dry erase marker when they are being responsible learners in class. 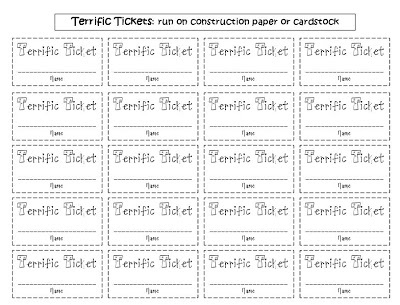 At the end of the day, we reward them with a Terrific Ticket that is placed into a class raffle. Again, raffle items can be extrinsic or intrinsic, depending upon the needs of your class. Some examples of things we’ve raffled off are school supplies, dollar store items, lunch with the teacher, line leader, and chewing gum in class, just to name a few. You can grab your own Terrific Tickets for printing for free here. This strategy is a little more tangible–the extrinsic rewards, if you will. But, we reserve the class raffle for those times of desperation, like the weeks before summer break. It doesn’t appear often, but when it does, it can be a fun motivator for kids and keeps us teachers one step ahead of them, too. Of course, there are lots of ways to motivate kids. Some classes just need a simple smile or a pat on the back. Other times, classes need a little extra motivation to keep them going. Whatever grade you teach, managing minds is just as important as enriching them as they bloom. We hope you’ll stop by our blog or TpT Store sometime. Thanks so much for having us! 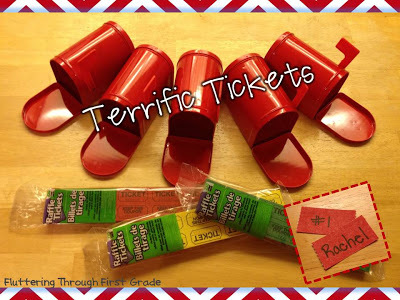 I love the Terrific Tickets idea and I am going to implement a version of this idea in my class this year. Thank you so much! It's so true that we don't say Name on Board for the 'bad' kids anymore. When I ask a student to go put their name on the board, the rest of the classes pays attention because that student did something good.